The Rag Blog: Kagan and Obama : Birds of a Feather? It's anything but surprising that President Obama has chosen Elena Kagan to replace John Paul Stevens on the Supreme Court. Nothing is a better fit for this White House than a blank slate, institution-loyal, seemingly principle-free careerist who spent the last 15 months as the Obama administration's lawyer vigorously defending every one of his assertions of extremely broad executive authority. The Obama administration is filled to the brim with exactly such individuals -- as is reflected by its actions and policies -- and this is just one more to add to the pile. The fact that she'll be replacing someone like John Paul Stevens and likely sitting on the Supreme Court for the next three decades or so makes it much more consequential than most, but it is not a departure from the standard Obama approach. 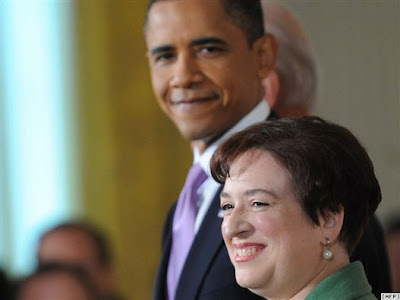 The New York Times this morning reports that "Mr. Obama effectively framed the choice so that he could seemingly take the middle road by picking Ms. Kagan, who correctly or not was viewed as ideologically between Judge Wood on the left and Judge Garland in the center." That's consummate Barack Obama. The Right appoints people like John Roberts and Sam Alito, with long and clear records of what they believe because they're eager to publicly defend their judicial philosophy and have the Court reflect their values. Beltway Democrats do the opposite: the last thing they want is to defend what progressives have always claimed is their worldview, either because they fear the debate or because they don't really believe those things, so the path that enables them to avoid confrontation of ideas is always the most attractive, even if it risks moving the Court to the Right. [R]ight now Obama has the biggest Democratic majority in the Senate he's ever going to have. So why not use it to ensure a solidly progressive nominee like Diane Wood instead of an ideological cipher like Kagan?... When Obama compromises on something like healthcare reform, that's one thing. Politics sometimes forces tough choices on a president. But why compromise on presidential nominees? Why Ben Bernanke? Why Elena Kagan? He doesn't have to do this. Unfortunately, the most likely answer is: he does it because he wants to. It's even less surprising that Obama would not want to choose someone like Diane Wood. If you were Barack Obama, would you want someone on the Supreme Court who has bravely and resolutely insisted on the need for Constitutional limits on executive authority, resolutely opposed the use of Terrorism fear-mongering for greater government power, explicitly argued against military commitments and indefinite detention, repeatedly applied the progressive approach to interpreting the Constitution to a wide array of issues, insisted upon the need for robust transparency and checks and balances, and demonstrated a willingness to defy institutional orthodoxies even when doing so is unpopular? Of course you wouldn't. Why would you want someone on the Court who has expressed serious Constitutional and legal doubts about your core policies? Do you think that an administration that just yesterday announced it wants legislation to dilute Miranda rights in the name of Scary Terrorists -- and has seized the power to assassinate American citizens with no due process -- wants someone like Diane Wood on the Supreme Court? One final thought about Kagan for now. As I said from the beginning, the real opportunity to derail her nomination was before it was made, because the vast majority of progressives and Democrats will get behind anyone, no matter who it is, chosen by Obama. That's just how things work. They'll ignore most of the substantive concerns that have been raised about her, cling to appeals to authority, seize on personal testimonials from her Good Progressive friends, and try to cobble together blurry little snippets to assure themselves that she's a fine pick. In reality, no matter what they know about her (and, more to the point, don't know), they'll support her because she's now Obama's choice, which means, by definition, that she's a good addition to the Supreme Court. Our politics is nothing if not tribal, and the duty of Every Good Democrat is now to favor Kagan's confirmation. Conservatives refused to succumb to those rules and ended up with Sam Alito instead of Harriet Miers, but they had a much different relationship to George Bush than progressives have to Obama (i.e., conservatives -- as they proved several times [Miers, immigration, Dubai Ports] -- were willing to oppose their leader whey they disagreed). The White House knows that progressives will never try to oppose any important Obama initiative, and even if they were inclined, they lack the power to do so (largely because unconditional support guarantees impotence). All that said, I've said everything I had to say about Kagan in the pre-nomination process in order to enable as informed a public discussion as possible, and am not going to endlessly repeat those criticisms now just for the sake of doing so. Perhaps the confirmation process, for once, will yield some valuable information about the nominee and we'll acquire at least some insight into how she thinks and what her judicial values and methods will be. I'm willing to keep an open mind. NPR's Nina Totenberg yesterday uncovered (or was provided) a relatively encouraging piece of evidence that no public commentators (including me) had previously discovered: a 2005 letter co-signed by Kagan which opposed a proposal by Lindsey Graham to strip "War on Terror" detainees of the right to habeas corpus on the ground that the proposal was a violation of core American principles (that provision was ultimately included in the Military Commissions Act and struck down in 2008 by a 5-4 Supreme Court as unconstitutional). The most important point to note about Kagan now is the one highlighted this weekend by Talk Left's Armando, as first reported by The Los Angeles Times: in 1995, Kagan condemned the Supreme Court confirmation process as "a vapid and hollow charade" and an "embarrassment," arguing that Senators should "insist that any nominee reveal what kind of Justice she would make, by disclosing her views on important legal issues." Kagan should absolutely be held to her own position in that regard. Her argument that nominees should be compelled to answer such questions was absolutely right, and that's especially applicable to Kagan in light of her own glaring lack of a real record on virtually everything. She ought to be held to her own position and "reveal what kind of Justice she would make" and "disclose her views on important legal issues." I'm certainly willing to listen if she does that and then make a rational assessment of her based on those answers. Anyone wanting to form a rational choice should demand that she do the same.